This Month In Review will be a shorter one, as I am not in a head/body/soul-space where I can really sum up May, but I also don't want to miss a post. Sitting on the balcony of my new flat - surrounded by trees and with a cuppa, I felt I would regret not writing at least something to mark May. A month that was more emotional and significant than I could have predicted. Word/quote of the month: "Black Holes and Revelations"
This may mean more to some than others, being a song lyric from Starlight by Muse and also the title of an album of theirs. It has always meant a lot to me - but in May it became painfully apt for many reasons. May was a month of exams - marking the end of my second year at university. And while they were stressful and I definitely had moments where I struggled - other happenings almost eclipsed them. And that is saying something. 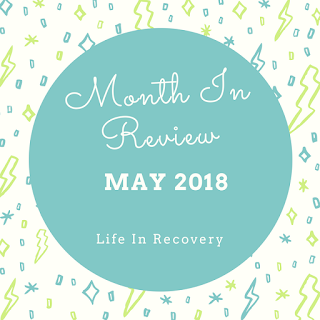 Some of my favourite people went through a lot of difficulties in May (and still are), and I was there to support them. And when my time came to need support - I found I had plenty of shoulders on which to cry (both metaphorically and literally). And while it is never a happy moment, it is an honour to be the one people go to to lean on, and a wonderful thing to have people you yourself can rely on too. While April was a whirlwind, and a month where tissues and issues were in force, May was similar. And although only some of the April issues were still 'active' during May - there were a few more to complicate matters. And add some bumps in the road. Sometimes an inner truth or truths can be revealed to you, slowly at first - growing bigger gradually. Coming more into focus as time goes on. Getting stronger and stronger. Being pointed out by too many people, or being brought into sharper focus too often. Until suddenly you have a moment of 'Revelation' and then your world seems a different place. And you can't go back to how things were, and you can't pretend you didn't have that moment. And you can't close the floodgates, or paper over the cracks, or try and repaint the lines; because the lines have been blurred for too long, you have been drawing, re-drawing and holding the line for too long and you can't keep it up, and the cracks have become too big to fill and the gates just won't stay shut on their own. And then you have to decide what to do. And you have to make decisions you may not want to make. You have to be deeply honest with yourself (and with a carefully selected few confidantes). And you have to do things that don't feel right (in fact they can feel downright wrong), but they are things that protect you, and put you first, and will help you in the long run. And however difficult they feel to do - you know that you must. But you also have to feel. Feel all the feelings. The proper stuff. The stuff that makes you want to curl up in a ball and never uncurl. The stuff that feels like it's killing you, or crushing you, or choking you. The stuff that makes you literally double over in pain and grief, and countless other emotions. But this is the stuff that makes you human; that makes you an emotional person; that makes you empathetic; that makes you wise; that makes you real; that makes you honest and true; that means you are brave; that means you are alive and living. And that is who I am. That is me. And that is what I have done. I have not been in denial. I have not buried my thoughts and feelings. I have not retreated to a safe place and repressed everything. Because, boy, that would have been easier in the short-term! And I will be glad - eventually - that I have done and felt all these things and that I will have come out the other side. I will be glad that I was congruent, integrated and honest. I will be glad that, despite feeling all that and struggling, I have managed to be present and enjoy certain things in May. I will be glad that I have not let everything be in shadows, and that I have done what I have absolutely had to, and needed to do, for my future. And I will be glad that I have protected myself, and put myself first. Black holes are described as: a region of space having a gravitational field so intense that no matter or radiation can escape. I think we all can feel like there are black holes for us. Things that pull us in. Things that require a lot, or all, of our energy and time. Things that we can't escape from - much as we may try. Whether it is a career, a pursuit, a person, a degree, a hobby - they may feel like black holes. Something so powerful that obliterates other aspects of our lives, or something that we let have power over us. But good news fellas, recent research shows that the stuff that goes into black holes may not be lost forever. So just remember that when you feel you are being pulled towards something, or when you are giving all your energy to something - it is going somewhere - it still exists - it isn't a hopeless outpouring. Because I don't want May 2018 to be remembered as a doom-and-gloom-filled month, my food has to be wedding cake. I had two weddings (in the space of two days) this month and they were so lovely and significant in their own ways. These weddings marked a step-change in lives, a public outpouring of love, a statement of togetherness and a joining of families. And what could be more beautiful than that. There were tears, late-night bacon sandwiches eaten on dance-floors, best man speeches, signing of registers with shaking hands (mine in one case - not the bride or grooms! ), fruit cake galore, champagne sprayed and love shared. I learned far too much this month, both in and out of school. And I can't really sum that up. So that is my lesson. We keep on learning. We never stop. And it's never an inappropriate moment to revise, relearn, teach yourself, be taught and remember. Goal for the next month: Re-gain my sparkle, and happily reflect on year two of university and all that I accomplished in that year.